Why just celebrate Waitangi for a week in February? Our Waitangi book encourages teachers and children to honour the spirit of Waitangi all year round, by learning how to keep the Māori culture alive and to care for our precious environment. I wrote this book because teachers had been asking me to do it for a couple of years. There were so few Waitangi Day books and resources that were easy for them to use in the classroom with young children, and they trusted me to help. However, I resisted their requests for a long time! The problem was that I didn’t know how to create a book and song that would work as a Waitangi Day resource. It seemed impossible – that is until the day I gave up trying and decided that if I was meant to do this book, then the idea would have to appear from somewhere other than me. And it did! The same day I decided that, the idea for this book came to me. I knew that a book about Waitangi Day had to be about the spirit of Waitangi. That’s where the idea for the story came from. I realised that the spirit of Waitangi is about caring for the Māori culture and caring for our precious environment. Our illustrator wasn’t available, so I decided to illustrate the book with photographs – some from stock photos and others taken by our daughter Sophie Holt. The book has been a great success and is loved by children and teachers in early childhood settings and primary schools around New Zealand. In the photo on the previous page, children at ABC Primrose in Hamilton sign their own treaties. 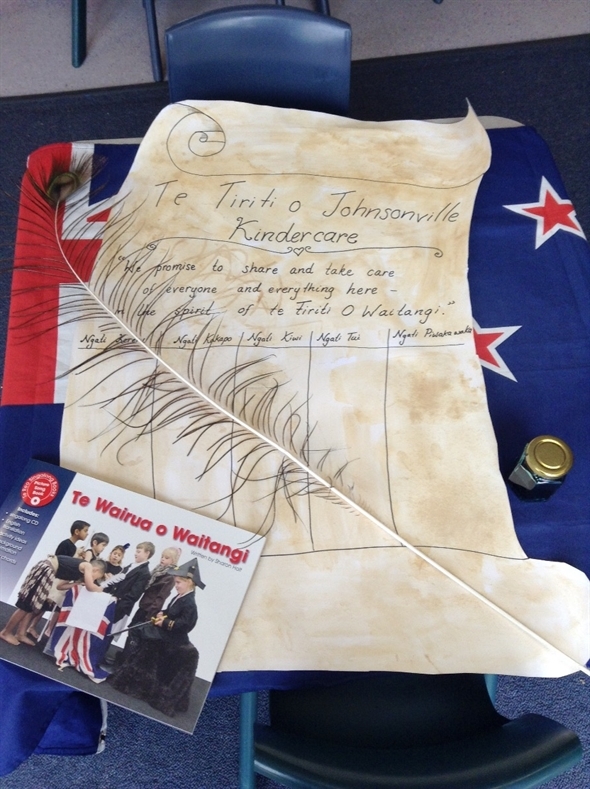 On this page, our book Te Wairua o Waitangi helps preschoolers at Kindercare in Johnsonville in their learning about The Treaty of Waitangi and the celebration of Waitangi Day.